Where to begin. 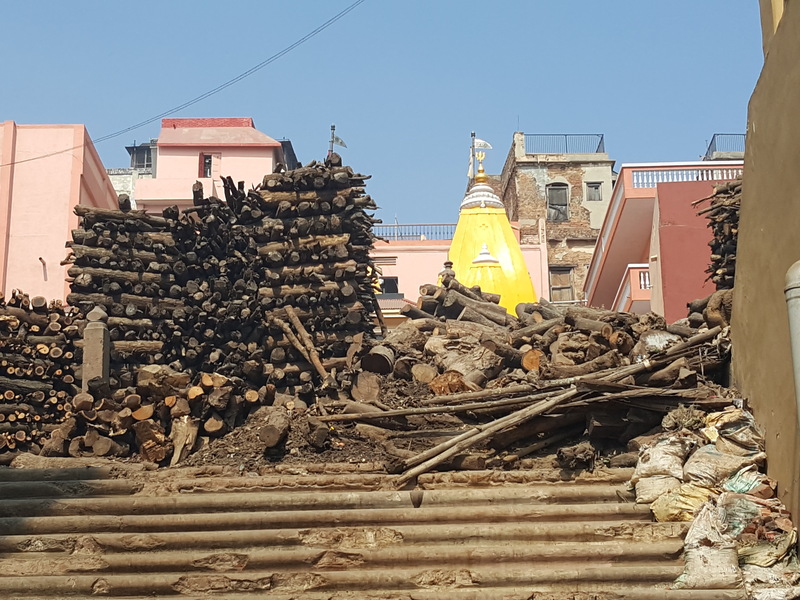 On a slope up from the Ganges lies the Manikarnika Ghat, that famous Indian crematorium we’ve always known about but not quite believed was real. 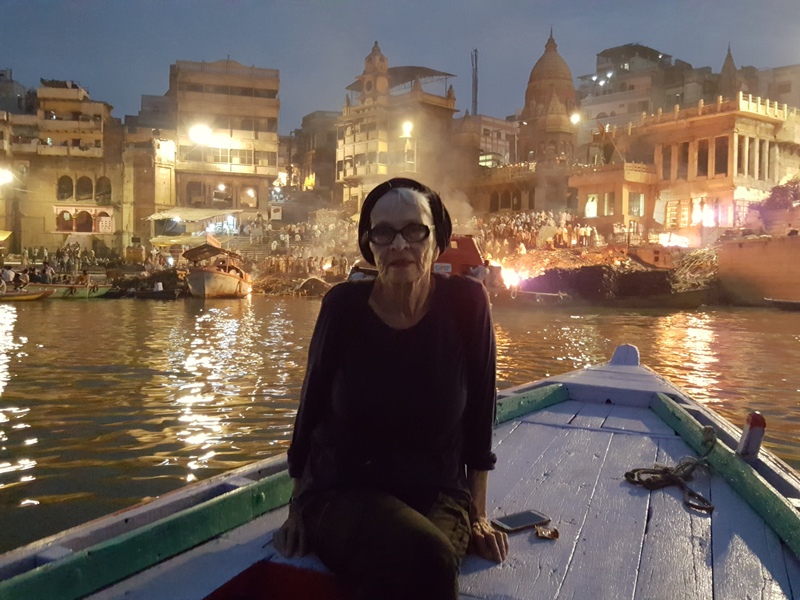 I was rowed a short way from the hotel to the Manikarnika Ghat on two evenings, and one morning I went there for an informal but still fairly in-depth tour. No photos allowed of the actual burning so you have only my poor words, and this is certain to be a time when my store of adjectives and adverbs fall short of the need. There are six or eight concrete platforms with steel side bars that rise from the river on a fairly sharp incline, stopping at the base of what once were imposing buildings The platforms are lined up at different levels on the hillside. At the top, large chunks of wood are stacked into piles; there are also some few other open type structures. Otherwise it’s mostly bare packed earth with the usual cows and dogs lazing about. Barges are constantly unloading the wood which is expensive sandalwood that overpowers the odors from the already-decomposing bodies as they burn. There is a hearse-boat that brings bodies from all over India pulled up at the waters’ edge. During my daytime visit, only one body arrived; it was wrapped in simple cotton pieces and carried on a stretcher of bamboo. The recently-passed person was unloaded and then immersed in the river a few times for purification after having rested in the family home for visitations during the past two days. He/she was then laid out, still in the dripping sheets, on the steps leading up the hill to dry out for an hour or so. There were two or three other recently departed souls ahead, wrapped after this initial drying period in prettier cloths with color and glitter and ribbon. A worker explained to me that before the actual cremation the shiny stuff will be removed because much of it is plastic, and the body will proceed into the fire in only a simple wrap. Apparently the wood is mostly placed on top of the body as it lies on the concrete bed. A body had recently finished burning near where I was sitting with only the skull left in the ashes. The chest/rib cages of men and the pelvic bone structures of women are the last to fully burn so in some cases they are pulled from the ashes and thrown into the river. Six categories of living creatures cannot be cremated. Children and pregnant women (babies and children are pure so there is no need for a purification rites); it’s the same for holy men, snake-bit humans and people with small pox. Animals are not cremated…nor killed…I’m told. Although obviously that means only certain categories since chicken dishes seem plentiful here. The site/crematorium has been owned and operated by the same family for generations. They are of the caste still called the Untouchables (although now there are more politically correct terms). In fact only Untouchables are allowed to oversee the handling of bodies and burial of people. ONLY PHOTOS OF THE SANDALWOOD ARE ALLOWED IN THE DAYTIME. In the daytime this was all unreal, dreamlike…thick clouds of smoke…stacks of buff-colored wood, a small number of workers moving busily about between the resident animals, still bodies; sweeping up, everything into the river. The family member who will light the fire for their loved one is shaved completely and then bathes in Ganges to purify himself for his task. Only the men of the family can directly participate because, I was told, women get too emotional and have been known to throw themselves into the fires of their burning husbands or grown children. The night scenes, looking on from the boats gathered round, is when the tableau becomes truly surreal. Six to eight fires burning briskly, crackling, snapping, smoking. On the bank they unload the tightly-shrouded bodies which are dipped in the river, and then laid out for that hour or so of drying. Then onto the pyre. You can just see the outlines of the family members gathered on the different levels and, always, the cows and dogs who live where they choose are front and center. I have a great desire to feel comfortable with death. I am close to or in that age category called old-old so now would be the time to separate fear of the unknown from fear of the process, and then try to come to terms with each. Yes, easier said than done. This visit to the Ganges and the Manikarnika Ghat is part of trying to get under that tough skin of the unknown, of knowing more about how cultures approach death generally. We’ve removed ourselves as far from it as we can in the west. We kill people with assault rifles and drones and then stack flowers up somewhere and utter pieties at all of the funerals; we kill animals out of eye and ear range and then pretend that tasty meat dish arrived at our table with no suffering or death involved. Here in the flames of the Manikarnika Ghat, it’s obvious, it is up close and personal, frightening but touchable in some way I can’t really explain. I meant to find some meaningful piece of prose or poetry to include here since this powerful experience deserves more than my limited language. I couldn’t find just the right thing but here are a few poems for your consideration and edification! All from the Hello Poetry site. while ferrying and burning the dead. that by all means seems closer than farther. read poetry at the burning ghat. The following might have come straight from one of my bloody detective novels but I swear it’s from Hello Poetry. In the cremation category. Aroma of cremated human flesh. ’round the Pole, God only knows. that he’d sooner live in Hell. you’ll cremate my last remains. to cremate these last remains”. “I’ll just take a peep inside. I guess he’s cooked, and it’s time I looked”. and he said, “Please close that door. it’s the first time I’ve been warm”. Out of curiosity, have you read (or heard of) Caitlyn Doughty’s “From Here to Eternity: Traveling the Globe to Find the Good Death”? I had not heard of it…but I believe I’ll look into it…I find myself ever more interested the older I get…not surprisingly I suppose. Thanks for the info…and for reading my post.